Beautiful Girl is a poetic and beautifully illustrated, motivational, children’s book, that helps build esteem … A great addition to your collection. Beautiful Girl is the follow on book after “Beautiful Boy”and in both books they’re in the trenches of despair … Is there hope? Does anyone care? Each story has its own explorative adventure, in search of the mystic mysteries buried deep within … & What do they find? You’ll need to get the book to find out! You can get a copy of the book on Amazon US or Amazon UK. Should you wish to, you can connect with the author via twitter. Please leave a comment below with your thoughts on this book. Does it pique your interest enough for you to want to get it? Would you recommend it to anyone? I would also appreciate it if you can share this page by clicking on one of the icons below. Now, before you leave, get some downloadable illustrations for children here for free. 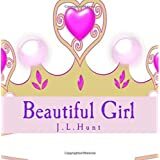 This entry was posted in Uncategorized and tagged Beautiful Girl, Beautiful Girl by J L Hunt, children's book, children's books, Inspiring Children's Book, Inspiring Children's Book: Beautiful Girl by J L Hunt, Inspiring Children's Books, Inspiring Children's Books: Beautiful Girl by J L Hunt, J L Hunt. Bookmark the permalink.